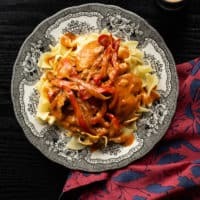 Chicken Paprikash Stew Recipe | Good. Food. Stories. 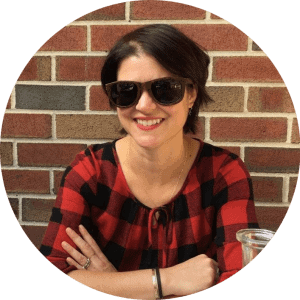 In our latest installment of Eating My Words, contributor Rebecca Peters-Golden gets the blood flowing with a passionate recipe—in fact, you could say it’s got some bite. I think Valentine’s Day gets a bad rap: candy, hearts, flowers—I mean, it would turn anybody’s stomach. More of a traditionalist, myself, I prefer to meditate on Saints Valentine of Terni and Valentine of Rome, martyred in the second century, or the Saint Valentine’s Day Massacre, a mob murder in Prohibition-era Chicago. Good times. And, of course, it’s a quick hop from martyrs and massacres to . . . you guessed it: Vlad the Impaler, or Dracula, when he’s at home. You want romance? That’s romance. 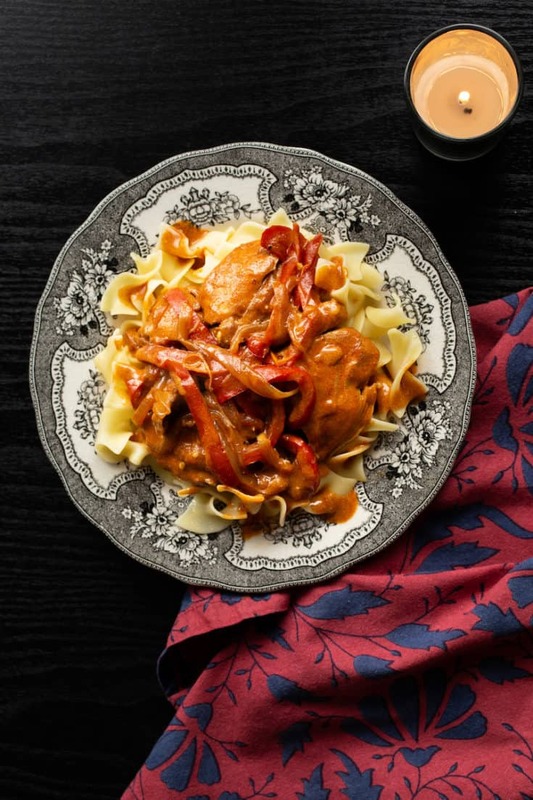 And it all starts over a modest bowl of thick, velvety Chicken Paprikash, a traditional Hungarian stew. In Bram Stoker’s Dracula (1897) hapless, well-intentioned solicitor Jonathan Harker is traveling to Transylvania for the first time at the behest of a new client. A client whose table manners are perfect, even if he doesn’t seem to eat. Still, Jonathan is wined and dined—and almost dined on. Jonathan notes in his journal that eating so much paprika gives him “all sorts of queer dreams” one night, as a dog howls under his window (5). Now, I don’t know about all that, but the lovely red color makes a pink sauce that is perfect for a romantic meal à deux. Bonus for Valentine’s Day: it’s a great, strong flavor that isn’t garlic, so your breath will be safe for your date (especially if your date is a vampire). I wish you the best of luck for a Valentine’s Day that is a little bit less candy hearts and a little bit more delicious dinner, with a date that may or may not inspire an undying passion that will last beyond the grave! “3 May. Bistritz–Left Munich at 8.35 p.m. on 1st May, arriving at Vienna early next morning. . . . Buda-Pesth seems a wonderful place, from the glimpse which I got of it from the train and the little I could walk through the streets. . . The impression I had was that we were leaving the West and entering the East. . . I had for dinner, or rather supper, a chicken done up some way with red pepper, which was very good but thirsty. (Mem., get recipe for Mina.) I asked the waiter, and he said it was called ‘paprika hendle,’ and that as it was a national dish, I should be able to get it anywhere along the Carpathians” (3). Oh, Jonathan, if only this recipe were all you brought back to London with you. 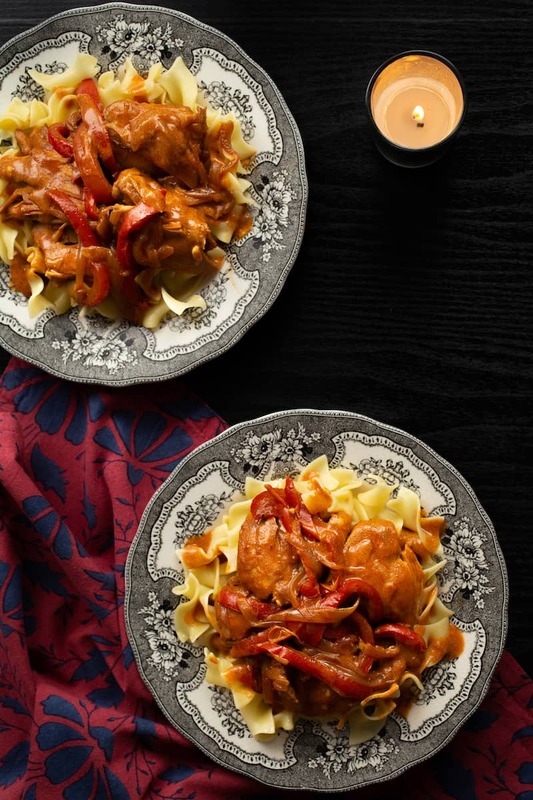 . .
Chicken paprikash, the traditional Hungarian stew, is thick and velvety with the subtle flavors of paprika and sour cream. It's perfect over noodles or rice. Heat the olive oil in a Dutch oven or stockpot over medium-high heat. Pat the chicken dry, then lightly salt and pepper it on both sides. Brown the chicken, about 4 minutes per side. Set aside. Lower the heat to medium, then melt the butter in the Dutch oven. Stir in the sliced onion and pepper, along with a sprinkle each of salt and pepper. Cook for 1 minute, then stir in the paprika. Cook for about 5-7 minutes more until softened, stirring occasionally, then lower the heat to medium. Return the chicken to the pan and pour in the stock. Cover and bring to a simmer, then continue to cook for 25-30 minutes until the chicken is very tender and can easily be pulled apart with a fork. Whisk the sour cream and flour together in a small bowl. Stir about 1/2 cup of the pan sauce into the sour cream mixture so the sour cream won't curdle. Gently stir the sour cream mixture into the pan and cook for 2-3 minutes more. 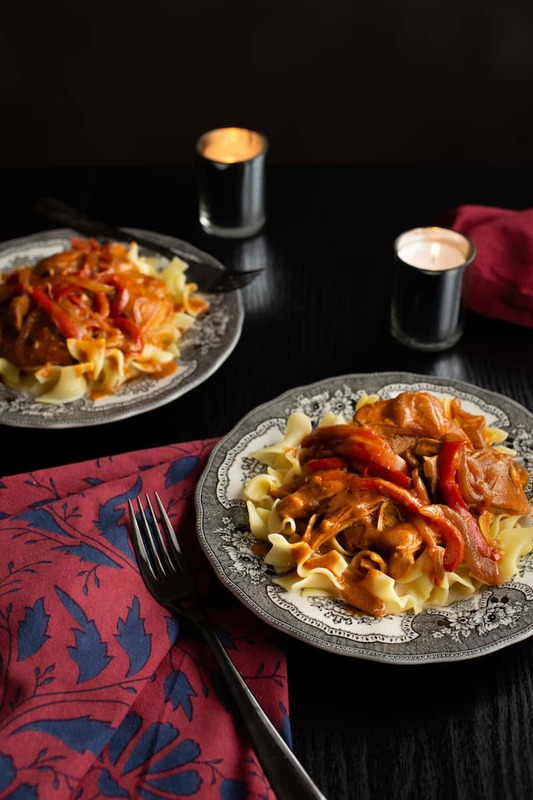 Serve the chicken paprikash on a bed of egg noodles (or rice, späetzle, dumplings, etc. ; or just dunk thick slices of buttered bread).